"Central government entities are obliged to deposit their cash reserves and transfer their term deposit funds to their accounts at the Bank of Greece," the decree published on the government website on Monday said. The "regulation is submitted due to extremely urgent and unforeseen needs," it added. The government is ready to make an exception for funds needed by local authorities to make their immediate payment needs. The decree also excludes pension funds and some state-owned firms. It acts retrospectively from March 17. The move comes as Greece is struggling to stay solvent while preparing for the next round of debt settling with the International Monetary Fund (IMF) amid the shortage of liquidity. The obligatory transfer of funds to the Central Bank can help Athens raise about €2 billion ($2.15 billion), said Bloomberg citing officials familiar with the matter. Greek finance ministry officials earlier told Reuters, the money was needed to pay civil service wages and pensions at the end of the month. The funds transfer decree comes ahead of Friday’s Eurogroup meeting in Latvia. Athens and the Eurozone’s finance ministers are expected to discuss another €768 million ($824 million) of debt repayment amid concerns over Greece’s possible default and exit from the Eurozone. 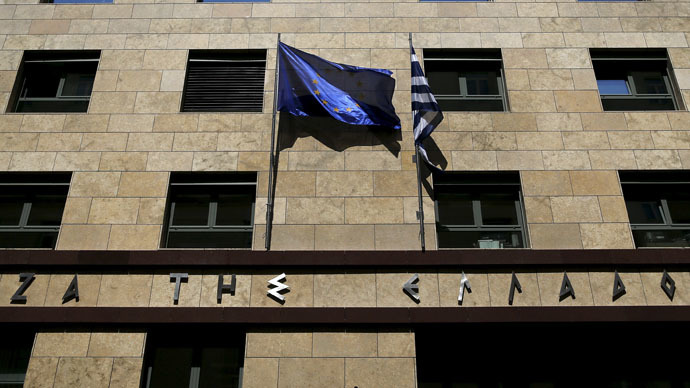 The Greek government and its international creditors have yet to set budget targets for 2015. They have also not mentioned the necessary policies to meet them, an official representing the lenders told Bloomberg on Monday. European finance ministers are waiting for a list of measures from Greece to reach a preliminary agreement on financing the country’s economy and the external debt. “The situation with Greece needs to be resolved soon. It would be a negative development if no progress is made at the meeting in Riga,” Harris Georgiades, the Cypriot Finance Minister told Bloomberg Television. Meanwhile, EU officials have shown little confidence about the possibility of an agreement being reached in Latvia. Dutch Finance Minister Jeroen Dijsselbloem said on Saturday in Washington “that a deal won’t be ready by the Riga gathering”. “Nothing, literally nothing has been achieved,” an unnamed EU official was cited as saying by Business Insider. He also added that the two sides were no closer to an agreement than when the Greek government took office almost three months ago.